In 1912, Portland lavishly hosted the Elks Grand Lodge Reunion and Convention in 1912 with flags, banners and arches. The lighted Entrance to the Grand Court of Honor at the Elks Convention in 1912. 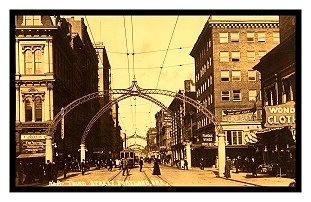 Lighted arches on Sixth Street for the Elks Reunion and Convention in Portland in 1912 were the inspiration for other lighted arches on Portland streets. Overhead view of the Grand Court of Honor on Sixth Street at the Elks National Convention in Portland in 1912. Portland’s Theatre District on Broadway in 1928. 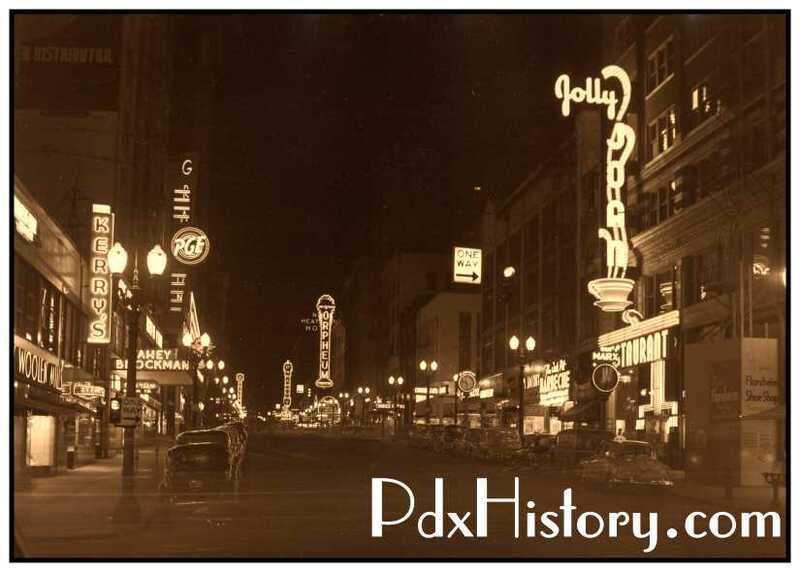 Looking south on Broadway, you would see one of Portland’s most popular restaurants, Jolly Joan, which featured a neon sign with the ever full steaming cup of coffee. Portland’s “Great Light Way” featured lighted arches that were erected up Third Avenue in 1914. Feeling pressure from the business boosters of Broadway as Portland street of commerce, the owners of business and property along Third Street banded together to form “The Permanent Order of Third Streeters” to promote and advertise their street to the world as the “Center of Business” in Portland. The “Third Streeters” financed the erection of immense steel arches spanning every street intersection from Yamhill to Burnside streets. In the center of each of these 10 arches, there was a brilliant 750-watt light globe. The arms of the arches each contained two hundred 10-watt globes. This ad appeared in the June 6, 1914 issue of The Oregonian. The lights were to be turned on for the first time that evening at 8 o’clock when a reign of carnival prevailed along the street as city dwellers welcomed the lighted arches with a parade and street fair. Daytime view of Third Street in 1916. Night view of Third Street in 1916. Initially, the arches were placed at each intersection from Burnside to Yamhill streets. Arches were added from Burnside to Glisan streets. The arches at Third and Morrison streets frame signs for Fred Meyer on the left as well as the Capitol Theater, the Rex Theatre and the Bon Marche Ladies Apparel. In 1926, a street-widening project for the opening of the new Burnside Bridge required the removal of the arch at Burnside. More street-widening in 1928 required the removal of the arches north of Ash Street. The financial fallout from the Great Depression caused the electricity to be turned off in 1937 and demolition began on the remaining arches. The city council removed all remnants of Portland’s “Great Light Way” when they ordered the removal of the final three arches in 1940.